The La Plage Resort is the ideal context for organizing conferences, events, seminars and incentives. The Conference Centre at the La Plage Resort offers two meeting rooms, which can accommodate up to 200 people and are equipped with modern audio/video systems. The surrounding area is calm and peaceful, ensuring the perfect atmosphere for discussions, group activities and relaxing moments. 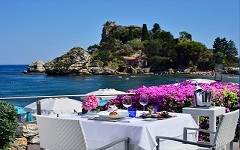 The elegance of the refined rooms and the exclusive location with its privileged views of Isola Bella, make the La Plage Resort a perfect location for celebrating anniversaries, for launching new products and for fashion shows.